Let your body experience the latest in inversion comfort with the Innova ITM5900 Advanced Heat and Massage Therapeutic Inversion System with large and ergonomic backrest pad and adjustable headrest pad. Our new Patent Pending massage/lumbar pad provides close up massage therapy to the entire spine area with heat targeted to your lower back/waist area. Combining a relaxing soft vibration massage with heat makes this inversion table one of the most therapeutic and advanced tables on the market to date. The 5-position angle system with patent pending protective cover makes adjusting to varying degrees of inversion simple and safer. Position the pin in the desired decline slot and know that your inversion will be comfortable and consistent each and every time. This ergonomical heel/ankle holders with longer, easy to adjust ankle holding system keeps your ankles locked in place securely and comfortably. The soft touch foam handlebars assist with returning to an upright position. 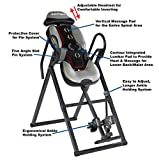 This ITM5900 inversion table is made of heavy duty steel tubing and boasts a weight capacity of 300 lbs and accommodates users that are between 4ft-10in to 6ft-6in. The frame is designed to fold for easy storage. Order with confidence as this unit includes our one year warranty. Interested in the Innova ITM5900 Advanced Heat and Massage Inversion Therapy Table? Is the price too high? You can easily price watch this product and we'll notify you when the price reaches your target.